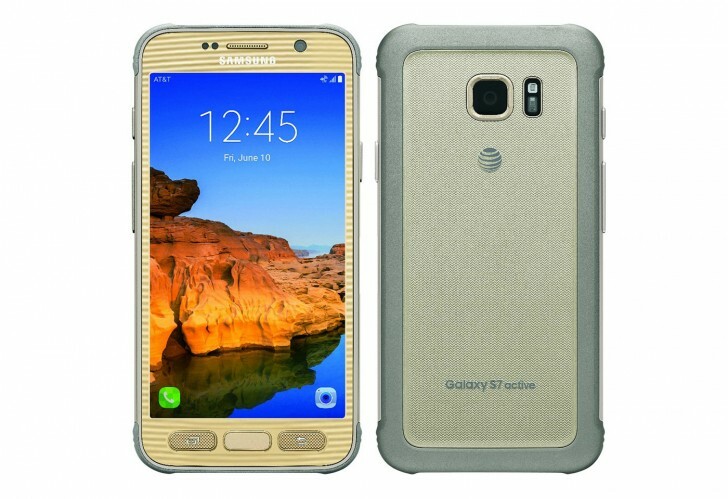 By now you probably know that a Samsung Galaxy S7 active is in fact in the works and it's coming soon to AT&T. The extremely rugged handset has been spotted in some live images already, and a benchmark run from a few days ago made sure that we know most of its specs too. So what next, you wonder? That would be a couple of leaked official press renders, of course. They show a previously unseen color version, which is probably the result of Samsung wanting to bring the oh-so-popular 'gold' hue to its line of rugged devices. The result, though, may not immediately be thought of as 'gold' by most people. The official name for this color could be 'desert camo' as @evleaks jokingly put it when outing the images. Like in previous leaks, you can see that the Home button doesn't have a label, which means it will almost certainly house a fingerprint scanner. The S7 active should ape most of the S7's specs, including the Snapdragon 820 SoC, 4GB of RAM, 12 MP rear camera, 5 MP selfie snapper, and QHD screen resolution. Battery capacity is still a mystery, though, especially since last year's S6 active surprisingly came with a much higher capacity cell than its non-rugged sibling. Yeah but is the S7/Edge also salt, dust, humidity, rain, vibration, solar radiation, transport and thermal shock resistant like the Active will be? It'll probably be housing a much larger battery.